Founded by Guitarist and vocalist Simon Bihlmayer, the band calls itself worshippers of 80s European Speed Metal, but “Overdrive” is much more than just pure speed, as the band brings in lots of tasty riffs to give you multiple eargasms. The music is much more diverse and slightly slower than what I expected with the name and the artwork. Make no mistake, it’s still fast and In-Your-Face speed machine, but just a tad bit slow. After a rather pale “It Begins”, the album rushes off with the insanely beautiful “Hell On Earth”. The polished production can be felt all over the music as each minute part of the music really pierces through my ears, and those sharp riffs are just pure bliss for my ever Thrash craving ears. With parts of sharp riffage and parts of melodic mid-tempo guitar work, the listen is taken to a roller coaster ride with shades of multiple sub genres sprinkled everywhere in this 6:19 min song, really, everything in “Psycho” is commendable. The vocals here are slightly of lower tempo than I expected, also considering the polished production here, was a bit of surprise. Axemen Julian and Simon up their anti with “Remote Controlled” as they belt some of the most exquisite riffage from 4:33 to the end. Incredible. The album chugs through the middle in a similar fast paced manner, full of juicy guitar work. Jakob Weikmann relentlessly hammers the drums. Though the latter half of the songs do not live up to the high expectations set by the first half of the album, the songs still blast every note possible to please the sensory just enough. What’s so intriguing about the music here is, the title track “Overdrive” brings in riffage which tells a story by itself, just like those classic 80s song, something I haven’t heard in any modern bands. Really that’s class, pure class. The album ends with a classic anthemic song with headbangable riffage “I See A Fire” leaving a ACCEPT esque feeling in the listener. 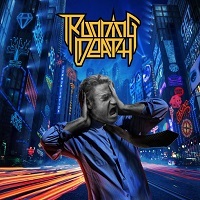 RUNNING DEATH for all the right reasons remind me of ARTILLERY, MEGADETH and CORONER as they please my ears with the riff based Speed/Thrash Metal. Other than the short less than 2 min songs, everything on offer here is commendable and worthy of your time.